An analysis released by Cover California yesterday showed Californians would pay significantly higher health premiums as well as reduced premium support under the proposed American Health Care Act (AHCA). The legislation, which is currently under consideration in the U. S. Congress, seeks to repeal the Affordable Care Act (ACA), more popularly known as Obamacare. Their figures account for the recently released Congressional Budget Office (CBO) analysis and detail the affects it would have on consumers in California’s 19 rating regions for non-group coverage. In their widely sited report, the CBO noted that AHCA premiums would increase 15 to 20-percent in 2018 and 2019 versus ACA estimated costs..
“The proposed changes to the subsidy structure would put coverage out of reach of many,” Covered California Executive Director Peter V. Lee said. 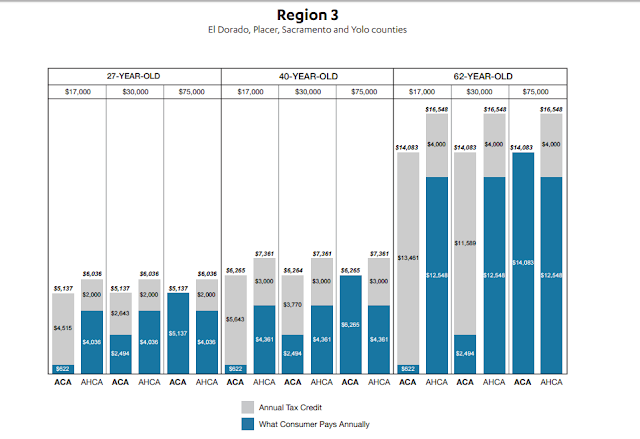 In the Covered California analysis, a 62-year old with a $30,000 income in the Sacramento region, which includes El Dorado, Placer, Sacramento and Yolo counties, currently pays about $2,494 in premiums with a subsidy of $11,589 for a total premium. See chart above, click to enlarge. Under the proposed AHCA, now dubbed Trumpcare, the total premium would escalate to $16,548. After a $4,000 tax credit, which is the cornerstone of the Trumpcare plan, the individual would now pay premiums of $11,589, or more than one third of their gross annual income. In Sacramento under the ACA, a 27-year-old earning $17,000 would pay 3.7 percent of her income toward health insurance premiums ($622 per year or $52 per month). By contrast, under the AHCA that individual would be asked to spend nearly 25 percent of her income on her health insurance premium, paying $4,036 per year or $336 per month. In Kern County, a 62-year-old earning $30,000 a year would pay 8.3 percent of his income toward health insurance premiums ($2,494 per year or $208 per month under the ACA). If the AHCA were in effect, he would be asked to allocate more than 30 percent of his income to health insurance, paying $9,182 a year or $765 per month. Finally, in Monterey County, a 62-year-old earning $17,000 would receive support under the ACA to limit her premium to 3.7 percent of her income ($622 per year or $52 per month). Yet under the AHCA, this consumer would have to spend 100 percent of her income on her premium and would still fall short of what it would take to purchase a plan that costs $17,873 per year, or $1,489 per month. The report said that the AHCA would provide cover some gaps currently not covered by the ACA. For instance,individuals who are above 400-percent of poverty level currently do not receive premium assistance but under the AHCA they would receive tax credit assistance.